Home | News | Regular broadcast emails - are you getting yours? 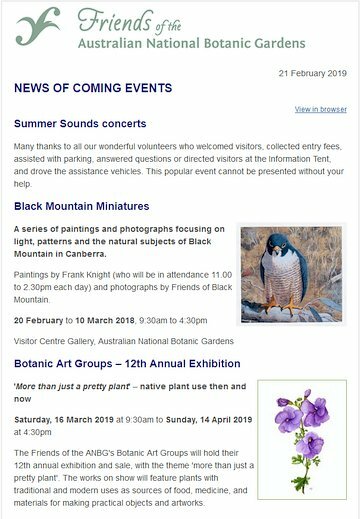 The Friends send out 'News of Coming Events' email newsletters, usually monthly, and occasional notifications of special events. These broadcast emails are also available from our web archive. use our email opt-in form to subscribe (or re-subscribe) to the email distribution list. We understand that some members choose not to receive these emails, and respect their right to unsubscribe. Once a member has unsubscribed we permanently remove their email address from the distribution list. If they later change their mind and wish to start receiving the emails again, they can use the opt-in form to put their email address back on the list.